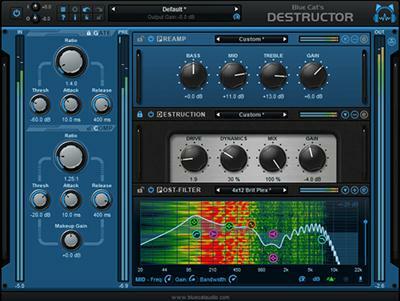 Blue Cat's Destructor is a powerful distortion and amp sim modeling tool capable of simulating any kind of distortion: from harsh digital destruction to smooth compression or guitar amp simulation (works for clean tones too. ), and most importantly, yours. It is delivered with hundreds of presets and predefined models, either inspired by existing gear (guitar & bass amps or cabinets, compressors, pedals, tape machines...) or created by our destructive minds. But the plug-in is not limited to these predefined models: all parameters of existing presets are fully editable, which gives you access to an unlimited number of distortion simulations - no need to purchase extra presets or amp models to build your custom tone. Based on a perceptual model rather than on electronic designs or impulse responses, the signal chain is reduced to its bare minimum, simplifying the process of tweaking the tone and making it fit into the mix. Thanks to its exclusive adaptive shaper, it is reactive to the playing of instrumentists, providing a very natural feeling, similar to analog gear. To make the look and feel of the plug-in fit with your favorites tones, it is bundled with more than 1400 visual styles that can be selected separately for each module. It is also possible to import reference curves measured with Blue Cat's FreqAnalyst Multi to quickly match existing tones. Powerful distortion and amp modeling tool. Works for "clean" sounds too. Get started with several hundreds of fully editable presets, inspired by real gear. More than 1600 visual styles to customize the user experience. Control the dynamics with the input gate and compressor. Control the tone with the pre and post filters. Exclusive shape dynamics control: adapt the tone to the dynamics of the signal. Use the internal or external side chain to trigger the distortion. Protect your ears with the output brickwall limiter. Comprehensive visual feedback: real time spectrum analysis, dynamic distortion curve display with embedded signal histograms. Load reference curves for tone matching.